The all-new Accent is poised to set a new standard for entry-level vehicles by introducing more sophisticated design and engineering to a traditionally modest category – the subcompact. In fact, Accent’s new, more spacious interior is now large enough to move Accent up into the compact category, and although the car is now bigger and features far more advanced technology, it’s sticker price will remain as buyer-friendly as ever. The 2018 Accent is launching as a 4-door sedan with a 5-door hatchback rumoured to be released at a later date. For the first time in its history, the hatchback will not be shipping to the United States and will apparently be a Canadian exclusive for North America. Final details are yet to be released. An all-new exterior design language elevates Accent’s curb appeal. Hyundai’s signature cascading grille proudly announces its lineage. The grille is flanked by wrap-around headlights and available LED signature daytime running lights. 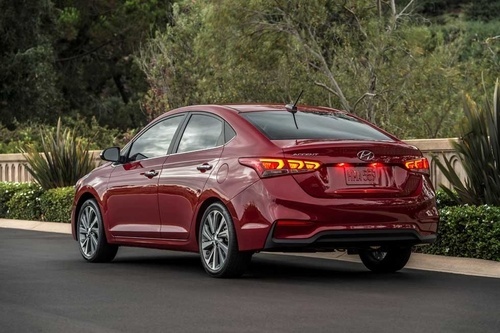 Features such as 17-inch alloy wheels and side mirror LED turn signal indicators add to the premium feel of the car. The interior of the Accent features improved interior roominess, high-quality materials, and premium technology features. With premium, soft-touch materials in key points and high-tech technologies, it creates an inviting and comfortable environment for drivers and passengers. A wide instrument panel prominently features a standard backup camera system with a 5-inch or optional 7-inch colour TFT LCD instrument display. Beneath the screen, the control panel is laid out in a horizontal design with buttons and controls logically grouped by function. 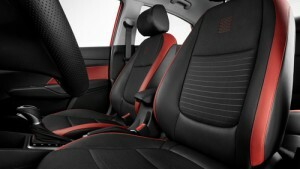 Accent also offers class-above interior volume. Accent sedan passenger volume is up 36 L, while Accent 5-door passenger volume increased by 38 L and the cargo area increase by a substantial 16 L partly due to the extended overall length. All-new Accent’s 1.6-liter “Gamma” four-cylinder Gasoline Direct Injected (GDI) engine is tuned for improved fuel efficiency and produces 132 horsepower and 119 lb. ft. of torque. The car’s SuperStructure. composed of 54.5% Advanced High Strength Steel is up from 41.5% in the fourth generation and has improved torsional rigidity by 32%, greatly reducing interior noise while simultaneously improving driving dynamics. New for 2018, Accent offers Autonomous Emergency Braking that utilizes a front forward facing radar to detect a vehicle and warn the driver of a potential collision. A six airbag system is standard, along with Electronic Stability Control, Vehicle Stability Management, Traction Control, and ABS. Most trims in the 2018 Accent will feature technologies ahead of the competition that enhances driver confidence and convenience, without the premium price. For example, the Accent also offers a proximity key with push-button start, so drivers never need to pull out a key from their pocket or purse. Looking for a new small car that represents your best possible investment? Take a long, hard look at Hyundai’s all-new 2018 Accent. Chances are it will both surprise and reward you with an ownership experience superior to anything the competition offers. Call for more details and to arrange a test drive.